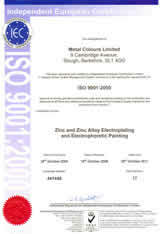 Quality: Metal Colours Ltd hold current accreditations for ISO 9001 -general management practice and ISO 14001 - environmental management systems. 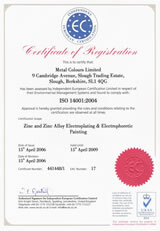 Certification was awarded through Independent European Certification Ltd. Customer Focus: Metal Colours Ltd is a technically competent, service focused and client-oriented company. We aim to continuously improve client satisfaction. Our marketing strategy is to develop partnership relationships with our clients and our technology suppliers.